The Office of the State Courts Administrator (OSCA) provides information and brief write-ups about newsworthy events happening in and around the Florida court system. Hurricane Michael Update - October 8, 2018 - 7:00 a.m. In an effort to make it easier for landlords and their tenants to resolve their disputes without the tenant being evicted, the Sixth Judicial Circuit is launching a six-month pilot program whose aim it is to encourage mediation. Historically, once a landlord files a petition to have a tenant evicted, the tenant has to respond in five days and enter the disputed rent in a registry. If the tenant fails to complete either of those two tasks, a judge typically orders the tenant evicted. If, however, the tenant completes those two tasks, the case is set for a hearing. Under the pilot program, a Pinellas County judge will now ask the landlord and tenant to leave the courtroom and see if they can work out their differences. One of the circuit’s contracted mediators will be on hand to assist, said Michelle Ardabily, chief deputy court administrator for the circuit. If the two parties can reach an agreement outside court, both will sign a court document to that effect, which the judge can then approve, Ardabily said. If they cannot, the judge will proceed to hear the full case. The pilot program will take place at the courthouse in downtown St. Petersburg, where county judges Edwin Jagger and Lorraine Kelly handle eviction proceedings. It commenced on Friday, Jan. 4, 2019, and will last through June. Eviction proceedings at the old historic courthouse in Clearwater will proceed as they always have. Eviction proceedings in Pasco, the other county in the sixth circuit, will also proceed as they always have. The pilot program is just one effort made in 2018 by the Residential Eviction Access to Justice Collaborative, to expand access to justice for those in the community facing eviction. Members of the collaborative have visited eviction mediation programs in the judicial circuit in West Palm Beach and in the circuit comprising Seminole and Brevard counties. In addition to working toward setting up the pilot program, the collaborative has also successfully worked toward amending the eviction notices issued by the Pinellas Clerk of Court to include information regarding inexpensive or free legal aid for beleaguered tenants, according to Kimberly Rodgers, executive director for the Community Law Program in St. Petersburg. Ardabily and Rodgers are members of the collaborative, as are various legal aid attorneys, housing officials, and retired judge David Seth Walker. The collaborative has also established relationships with a handful of agencies that provide rental assistance, and it has secured a small amount of funding itself to pay some tenants’ past due rent, Rodgers said. Funding for the collaborative’s efforts in 2018 was provided by Foundation for a Healthy St. Petersburg, a non-profit organization that works toward improving health equity in south Pinellas County. The collaborative has already secured some funding from the Florida Bar Foundation for its 2019 efforts, which will include working with the sixth circuit to monitor and evaluate the circuit’s mediation pilot program and supporting its expansion countywide. Hurricane Michael hammered communities -- and the courts that serve them in the Panhandle’s Second and Fourteenth Judicial Circuits -- taking lives, destroying property, and knocking out communications and transportation across a wide swath from the Gulf to the state line. The impact on state courts is significant. Recovery to get courts open has been concentrated while ongoing challenges will continue long into the future. 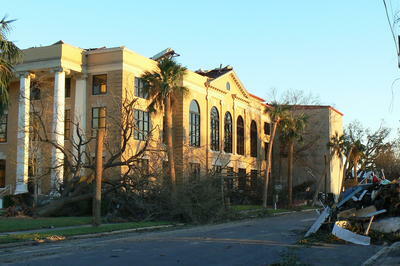 Hurricane Michael caused extensive damage to the Bay County Courthouse in Panama City. Water intrusion and power loss crippled the Fourteenth Judicial Circuit’s computer network, but diligent work by administrative staff in Bay County, with help from information technology staff from around the state, has helped courts in all six counties of the Fourteenth Circuit to open as of Monday, October 29. Photo courtesy Mark Dreyer. Courts closed to prepare ahead of the Category 4 hurricane’s landfall October 10 between Panama City and Mexico Beach. On that day, courts were closed in 27 counties within six judicial circuits. Judges and staff from Apalachicola to Panama City, from Tallahassee to Marianna, began assessments and recovery efforts immediately. On Monday, October 29, all state courts in Florida re-opened. Court operations in Bay, Calhoun, Gulf, Holmes, Jackson, and Washington counties — those comprise the Fourteenth Circuit — will be limited to some degree. “We’ll be limping, but we’ll be open. We’ll be at our desks on Monday,” said Judge Elijah Smiley, chief judge of the Fourteenth Judicial Circuit, ahead of the return of judges and staff. Essential hearings were conducted throughout the emergency. Judges went to jails to conduct first appearances. Judges in less-impacted adjoining circuits, under authority of an order by the Supreme Court, presided over detention hearings and others. It has taken a tremendous amount of work by emergency responders, utility crews, National Guard, county staff, judges and court staff both local and from around the state to begin recovery. Chief Judge Smiley made his way to the Bay County Courthouse in Panama City in the immediate aftermath of Michael. Downed trees littered the lawn, all power was out, cell phone signals were nonexistent, roads were washed out and blocked by mile after mile of felled trees. “My chief and primary concern is to make sure our people are safe and able to take care of the health and welfare of their families,” Chief Judge Smiley said. All judges and staff were contacted and found safe. Homes of some judges and staff members were destroyed, many had significant damage. Chief Judge Smiley was determined to overcome the challenges. With pencil and letterhead, he delivered a handwritten news release about courts closures to the only still-broadcasting radio station in Bay County. He used a combination of creative technology solutions to get E-Portal access and could see emergency motions filed with the courts. Others were as creative and determined. Grant Slayden, trial court administrator in Tallahassee-based Second Judicial Circuit, and Steven Hall, chief of General Services for the Office of the State Courts Administrator, gathered satellite phones from other circuits and the OSCA and arranged for their delivery by members of the Florida National Guard. Recovery teams from North Florida, including staff members from the Fourth Circuit, the Third Circuit, the Second Circuit, the First Circuit, the Eighth Circuit, and the OSCA, traveled to Panama City to aid in work to reconfigure network servers damaged in the storm. “Communication has been the hardest thing,” said Robyn Gable, trial court administrator in the Fourteenth Circuit. The challenge was amplified because of the circuit’s size, with staff members across its six counties covering 100,000 square miles. Work to restore access to justice moved forward as the people who work in the judicial branch also responded to hardships and challenges in their own lives. Judges’ homes were destroyed, staff members’ homes were destroyed. Those who had evacuated had to get home, some to find significant damage, all without power, many without water. Chief judges from around the state met on Friday, October 26, for a regularly scheduled meeting. Supreme Court Chief Justice Charles T. Canady noted the cooperative efforts and the presence of Judge Smiley. “We have so many people who have been pitching in and helping. I want to thank Judge Nobles and Judge Sjostrom for pitching in and having their judges help,” Chief Justice Canady said of the chief judges in the adjoining First Judicial Circuit and Second Judicial Circuit. Judges in those circuits have been authorized, by an administrative order issued by the chief justice, to preside over cases in the battered Fourteenth Circuit. The Supreme Court has issued, or will, extensions of time for all jurisdictions impacted by the storm, protecting parties with deadlines during closures. The third Thursday of October is Conflict Resolution Day. Celebrated all across the world, Conflict Resolution Day was established to promote awareness of mediation, arbitration, conciliation, and other methods for resolving disputes creatively and amicably. Because mediation is the alternative dispute resolution (ADR) process that Florida’s courts utilize most frequently, this special day is commemorated with a Mediation Day event in the Florida Supreme Court courtroom. Ms Susan Marvin, chief of the Florida Dispute Resolution Center, welcomes students to the Mediation Day event at the Florida Supreme Court. 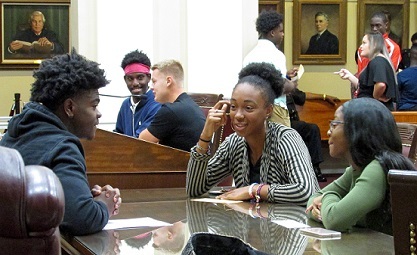 Each year, students studying conflict resolution skills at neighboring schools mark Mediation Day with a trip to the state’s highest court, where they participate in education sessions facilitated by Florida Dispute Resolution Center staff. 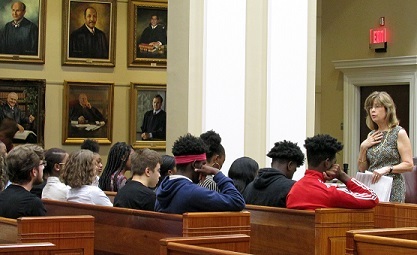 This year, 32 high school students from Florida State University School and 15 students from Fairview Middle School visited the court to learn about peaceful methods of dispute resolution, do a small-group mediation exercise, and take a tour of the supreme court library and rare book room. 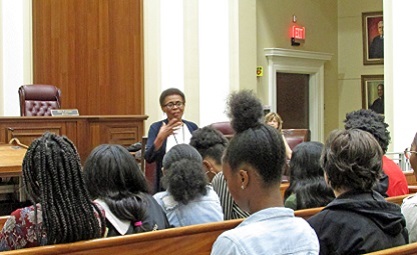 The highlight of their visit was a presentation by Justice Peggy A. Quince, who talked to them about the values of mediation and then answered questions about ADR and about her journey to the supreme court bench. Justice Quince talks to the visiting students about the values of mediation. The immediate goal of peer mediation is to teach students how to resolve disputes peacefully in their schools. But it has a far-reaching goal as well. The essence of democracy is the ability to resolve differences through civil means; in learning ADR skills, these students are learning how to listen respectfully to and to care about what other people say. Students working in small groups on mediation exercise. 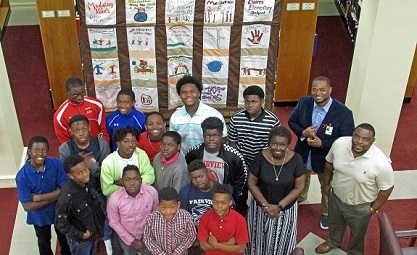 Fairview Middle School students and their teachers pose in front of the “Let’s Peace it Together” quilt (on display in the Florida Supreme Court Library), which was created to remind everyone to use mediation and not violence. Justice Quince and DRC staff pose for a photo with the Florida State University School students in the supreme court courtroom. PANAMA CITY – Damaged buildings, limited communications, restricted transportation, and compromised technology in the aftermath of Hurricane Michael mean state courts in the Fourteenth Judicial Circuit will continue court closures into next week. Each county faces unique issues. Re-opening will happen as each county is able. Judges and courts staff are working cooperatively with county partners, state and federal responders, and judicial branch judges and personnel from around the state to restore access to justice swiftly and safely. Bay County: Courts are closed through Friday, October 26. Calhoun County: Courts are closed through Wednesday, October 24. Limited Clerk of Court’s operations are available now. Gulf County: Closed through Friday, October 19. Open on Monday, October 22. Holmes County: No court proceedings through Friday, October 26. No jury service during the week of October 22. Clerk of Court’s office is open. Jackson County: Courthouse closed through Friday, October 26. No jury service during the week of October 22. Washington County: Closed through Wednesday, October 24. No jury service during the week of October 22. All judges and staff are safe after the storm, though many experienced property damage. Some judges and staff lost their homes and have relocated temporarily. Initial assessments of facilities and technology have been completed and continuation of operations plans have been initiated. Teams of staff from nearby circuits are scheduled to help on site. Chief Judge Elijah Smiley provides an online message from the hard-hit 14th Judicial Circuit and Bay County. State courts in the circuit’s six counties will be closed through Friday, October 19, as recovery efforts continue following Hurricane Michael. “The sunrise is beautiful and the breeze is renewing this morning in the Fourteenth Judicial Circuit. Our faith is enduring and our spirits are too large to be crushed by any storm. I can’t wait to be part of the rebuilding process. We will rebuild even better, stronger, and even more beautiful,” Judge Smiley wrote in a Sunday message posted on the circuit’s website. Judge Smiley noted the help already provided by staff in other judicial circuits, including the Second Judicial Circuit where damage and recovery are also under way in its counties. Coordination of response aid and administrative assistance has been ongoing since before landfall and will continue in the days and weeks ahead. Updates on closures, extensions of time, and other news of note will be available on social media and websites of the Florida Supreme Court, the Office of the State Courts Administrator, and individual circuits. The Florida Supreme Court’s website includes the complete, definitive list of state court closures. If you are a party in a court case, an attorney, a citizen called to jury service, or an employee of the courts, please keep up on announcements from local jurisdictions. You can find the websites of each judicial circuit and district court on the website. Updates are also available on social media accounts. You can find a full list of those accounts on the FL Courts website as well. All jurisdictions’ social media posts and regular updates of all storm-related announcements will be gathered and posted on the social media accounts of the Office of the State Courts Administrator at @Florida_Courts on Twitter, Florida Courts on Facebook, and Florida Office of State Courts Administrator on LinkedIn. Guardians are surrogate decision-makers who are appointed by the court to manage the personal and/or financial affairs of a person who is legally unable to manage his or her own affairs (e.g., a minor or an adult with a developmental disability, a mental health disability, or an age-related disability) and for whom less restrictive alternatives are found by the court to be inappropriate or unavailable. October is Guardianship Month in Florida—a time when local governments all across the state issue proclamations thanking guardians for providing a voice and vital services to these vulnerable Floridians. In addition to being an opportunity to acknowledge the critical work of Florida’s public, professional, and family guardians, Guardianship Month is also an ideal time to highlight some of the ways in which Florida’s judicial branch is working to identify, assess, and improve guardianship practices and other decision-making alternatives so as to best meet the needs of people requiring decision-making assistance. Florida, the nation’s third most populous state, has the highest rate of residents with one or more disability: 23.5 percent of adults in Florida are said to have some type of disability (Centers for Disease Control and Prevention). Florida also has the highest rate of residents aged 65 years and older, and, since the risk of having impairments grows with age, the number of people with disabilities in Florida is likely to increase in the years ahead. Currently, nearly four million Floridians, approximately 19.5 percent of the state’s inhabitants, are at least 65 years old (Florida Department of Elder Affairs). The state’s burgeoning elderly population has significantly intensified the growth in guardianship cases; in fact, guardianship is one of the few case types in the state that has shown growth over the last five years. Perceiving the rise in guardianship cases as a potential trend, the judicial branch has been involved in two significant efforts to improve guardianship processes. First is the supreme court’s Guardianship Workgroup. Established in October 2016 under the umbrella of the supreme court’s Judicial Management Council, this workgroup, chaired by Judge Olin Shinholser (ret. ), Tenth Circuit, examined judicial procedures and best practices pertaining to guardianship to ensure that courts are best protecting the person, property, and rights of people who have been judged to be incapacitated and people who may have diminished capacity to function independently. The workgroup also developed strategies for improving accountability to better protect people under guardianship. And second, with a grant and technical assistance from the American Bar Association and the National Center for State Courts, the supreme court has been guiding a court-community partnership focused on improving practices in adult guardianship and providing less restrictive decision-making options. Florida’s Working Interdisciplinary Networks of Guardianship Stakeholders—WINGS—is a broad-based, interdisciplinary, collaborative initiative that aims to facilitate the coordination of key representatives from the various stakeholder groups to ensure that efforts are not duplicated and that collective impact is preserved. Establish a process for courts to notify the Social Security Administration when a guardian of the property who is also a representative payee is removed. Through the recommendations of the supreme court’s Guardianship Workgroup and the concerted efforts of the stakeholders involved in the WINGS initiative, the judicial branch is working to improve processes in and increase the effectiveness of the state’s guardianship systems, thereby enhancing the quality of care and lives of vulnerable Floridians. Recognizing the importance of playing a proactive role in heightening reporters’ understanding of the court system, the supreme court has hosted an Annual Reporters Workshop each fall since 1989. Presented by The Florida Bar Media and Communications Law Committee, these two-day events are designed to teach the basics of legal reporting to print, TV, radio, and online journalists who are new to the legal/courts beat, providing them with a helpful introduction to covering justice system issues. The sessions vary each year, but they generally focus on matters such as effective techniques for reporting high-profile cases, merit retention in Florida, public records and how reporters can obtain the ones they need, libel law and defamation, lawyer regulation, and journalism in the world of social media. In addition to veteran reporters, presenters include justices, judges, attorneys, and professors. Twenty-one journalists participated in this year’s Reporters Workshop, which took place on September 24 – 25. Observed annually on September 17, Constitution Day marks the day on which the US Constitution was signed in 1787. At Constitution Day events all across the nation, celebrants are informed that the Constitution—which established this country’s national government and fundamental laws and which guarantees certain basic rights to all its citizens—is the basis for America’s great heritage and is the foundation for the American way of life; are reminded that they are responsible for protecting and defending the Constitution; and are encouraged to study the historical circumstances that led to the formation of this cardinal document. To celebrate Constitution Day this year, the Florida Supreme Court opened its doors to walk-in visitors on Saturday, September 15. This family-friendly event, which took place between 10:00 a.m. and 4:00 p.m., was a rare opportunity to see the state’s highest court outside of regular business hours. Visitors who ventured into the courtroom were invited to don long, black robes and sit in the justices’ chairs for photos. Guests could also visit the other public areas of the building: the rotunda, the portrait gallery, the Lawyer’s Lounge, the rare book room, and the library, where they could watch a video introducing them the supreme court, narrated by Chief Justice Charles T. Canady. (Take this link to the Welcome to the Florida Supreme Court video.) Court staff handed out pocket constitutions to everyone and were available to answer questions about Florida’s judicial branch of government and to provide information about the history of the Florida Supreme Court and the treasures in its rare book room. Even though court staff had little time in which to coordinate and advertise this event, 64 people—42 adults and 22 children—participated. Given its success, staff are hoping to make Constitution Day an annual happening at the supreme court. Long black robes, fast-paced oral arguments, and complex opinion-writing are some of the typical things that come to mind when people think of the Florida Supreme Court justices. But contrary to popular belief, the day-to-day life of a justice consists of much more. Their work extends far beyond their public presence on the bench. The fact that no two days are alike makes the jobs of the justices exciting and worth sharing with readers. With the input of Chief justice Charles T. Canady, Justice Peggy A. Quince, and Justice Alan Lawson, this article will provide a look at some of their daily responsibilities. Justice Lawson speaking with UCF legislative scholars. Justice Quince speaking at the Justice Teaching Institute. Chief Justice Canady speaking with a group of student visitors. Although being a Florida Supreme Court justice can be quite rigorous and demanding, the justices still make spending time with their families a priority. Balancing work and personal life surely has its challenges, but Justice Quince shared the importance of making time for herself and her family each day. Justice Quince, who is set to retire this January, discussed how she managed raising younger children with the demands of being a justice when she first started at the supreme court. “I had to make sure they were fed, had their homework done, went to soccer practice….You get it done because you know it has to be done,” she said. Now that her children are adults, Justice Quince has more time to travel and participate in education and outreach engagements. The justices are indeed dedicated to their work, but they cherish the special moments with their family as well in order to keep them going. Serving on the state’s highest court and affecting the lives of all Floridians, they know how important it is to find that crucial balance. Chief Justice Charles Canady, Judge Melanie G. May, and State Courts Administrator PK Jameson are pictured with the National Center for State Courts Distinguished Service Award presented to Fourth District Court of Appeal Judge May at the annual meeting of the Conference of Chief Justices and Conference of State Court Administrators in Newport, Rhode Island. Williamsburg, Va. — Judge Melanie G. May, who serves on the Fourth District Court of Appeal in Florida, on Tuesday received a National Center for State Courts Distinguished Service Award, it was announced on Wednesday. Judge May became a judge in 1991, starting as a circuit court judge in Broward County before moving to the court of appeals in 2001. She served as chief judge of the appellate court from 2011 to 2013. While on the Broward bench, she distinguished herself by overseeing one of the nation’s first drug courts, focusing on getting treatment to nonviolent offenders. As a lawyer and a judge, she has been known as thoughtful, hard-working and always prepared. She also has a reputation for looking for ways to improve the justice system and the lives of those involved in that system. As evidence of that commitment, she is on the Supreme Court of Florida Steering Committee on Treatment-Based Drug Courts, and she served on the Advisory Council to the Office of Drug Control since 1999. She has been a member of the Reentry Task Force and the Trial Court Performance and Accountability Committee. On a national level, Judge May served as a member of the National Association of Drug Court Professionals and of the Council of Chief Judges of State Courts of Appeal, chairing numerous committees and now serving as its president. The National Center for State Courts has published the 2018 Trends in State Courts, Courts and Society. This year’s Trends features two articles about Florida Courts initiatives. Miami-Dade Circuit Judge Mari Sampedro-Iglesia has written about GRACE Court, the nation’s first unified human-trafficking court in the 11th Judicial Circuit. John Couch in the Office of the State Courts Administrator wrote an article on Florida’s Early Childhood Court Initiative. Both of these articles are informative, effective, and positive reflections on innovative approaches in our state. There are many other topics and programs highlighted in Trends from elsewhere in the country and these, too, are of interest for Florida. There are articles on New York’s approach to opioid intervention, access to justice and immigration issues in state courts, and forward-looking surveys of cybersecurity and courts, among much else. Less than three years after the eight Florida Eldercaring Coordination Pilot Project Sites first launched, eldercaring coordination has now been recognized by the United Nations. On June 14, 2018, Linda Fieldstone and I, the co-chairs of the Florida Chapter of the Association of Family and Conciliation Courts Eldercaring Coordination Initiative, presented on eldercaring coordination with Sue Bronson, co-chair of the Association for Conflict Resolution Elder Justice Initiative, at a program sponsored by the Committee on Ageing and the International Network for Prevention of Elder Abuse. It was attended by representatives from the U. N. Missions who are members of the Group of Friends of Older Persons. Eldercaring coordination was one of only two programs presented at the U. N. on behalf of North America. other similar indicators of high conflict within the family. Eldercaring Coordinators (ECs) are trained and qualified to work with family members and help them to let go of their differences, build commonalities, and focus their energy on the needs and welfare of their elder. Eldercaring coordination manages family dynamics, provides a support system as the elder transitions to distinct levels of care, addresses risks, and promotes safety of the elder, including monitoring situations where caregivers may be over-extended. Eldercaring coordination fosters self-determination of the aging loved one for as long as possible. The EC is appointed for a period of time up to two years so that the family can return to eldercaring coordination instead of court if new issues arise. Fees for eldercaring coordination vary. The ECs set their own fees just like any other professionals. The Eldercaring Coordination Pilot Project Site Administrator works to best match a family to an EC who is the most accessible, affordable, culturally appropriate, and best-suited to the issues the family brings to the table. The judge referring the family to eldercaring coordination will allocate the EC’s fees among the parties. StayWell, the managing entity for Medicaid and Medicare in Florida and many other states, has bestowed a grant of $1,000 per pilot project site in recognition of family conflict being a healthcare issue for aging persons. StayWell hopes that its grant will enable more families to use the eldercaring coordination process to address family conflict. Beginning in 2019, StayWell members in Florida may also apply their coverage to the cost of eldercaring coordination when recommended by their care managers. The American Arbitration Association Foundation has provided a grant to supplement the cost for training ECs. At least one training for ECs is being planned for the fall as Maryland is piloting a new site, and Ohio and Idaho are expanding their pilot sites. Toronto, Ontario, and Orange County, California are also hoping to launch new Eldercaring Coordination Pilot Project Sites soon, too. The feedback that has been received on this groundbreaking approach to conflict in families caring for elders has all been positive. In one case, the presiding judge remarked that it saved the life of an elder whose care was in abeyance until the EC helped the family develop a care plan. In another case, the elder remarked that this was the best Father’s Day he ever had because eldercaring coordination enabled family members, who had been blocked from visiting, to finally have access to him. The EC works with the family to develop better communication and negotiating skills so that the court does not have to micromanage the elder’s care. The judges who have referred cases to eldercaring coordination notice a marked reduction in the number if not a total elimination of contested hearings in those cases. 18th Judicial Circuit (Seminole and Brevard Counties). If you are not in a pilot site circuit but are interested in bringing eldercaring coordination to your circuit, contact Linda Fieldstone for more information. The process is simple. You will receive assistance in identifying people already in your Circuit who can be trained to become Eldercaring Coordinators. All the forms you will need to refer cases have been drafted in a template and will be made available for your use. You will receive preliminary training in identifying and referring cases, and an invitation to monthly meetings as well as continuous support available whenever you need it. Pictured above from left to right: Susan Somers, Judge Michelle Morley, Sue Bronson, and Linda Fieldstone participating at the 2018 World Elder Abuse Awareness Day Global Showcase event. " The U. N. presentation is accessible via UN Web TV. More information on eldercaring coordination, can be found at Florida Eldercaring Coordination and the Ohio Channel broadcast of Court News: Ohio Judges Trained on Cutting the Conflict for Elderly Care. With the exception of celebratory rites of passage like marriages and adoptions, courthouse visits are not typically associated with happy times in most people’s lives, notes Ms Lynn Allen, family court manager with the Seventeenth Circuit. Indeed, “Going to a courthouse can be an exhausting, confusing, and stressful time” for people, she emphasizes. And if they also need legal or social services to help them navigate court processes, and if they don’t know (or don’t know how to find out) which service providers to seek out—or if they go to an agency that can’t help them and they are directed to another agency across town, for instance—they may feel they’re having to negotiate “layers of barriers to get the assistance they need”—and to get access to the court generally. In addition to being frustrating and overwhelming, this experience “wastes precious moments” and heightens people’s unease at an already-strained time in their lives. Aiming to mitigate these kinds of tribulations, the Seventeenth Circuit recently introduced a new initiative called Self-Help @ the Seventeenth, which facilitates people’s access to the services they need, all under one courthouse roof. Women in Distress of Broward provides victim compensation and relocation services and assistance to victims of domestic violence, including referrals to attorneys for legal assistance. The “stars aligned” to make Self-Help @ the Seventeenth a reality, agree Ms Allen and Ms Kathy Pugh, the circuit’s trial court administrator. 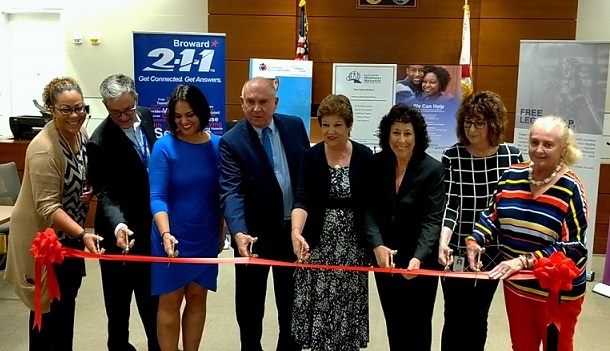 When Broward County’s new courthouse, the Central Judicial Complex in downtown Fort Lauderdale, opened in March 2017, they quickly realized that they have more small offices for mediations and depositions than they need for those purposes. So a lightbulb went on in Ms Allen’s head: she has been working in court administration for 24 years, so she remembers when the supreme court’s Family Court Steering Committee issued a recommendation, in a 2001 report, that each court institute a self-help program to provide intake, screening, and procedural guidance to self-represented litigants in family court cases. And she also remembers that the Seventeenth Circuit had such a program—until it was eliminated with the 2004 implementation of the constitutional amendment known as Revision 7 (Revision 7 shifted a significant portion of the responsibility for funding the trial courts from the county to the state, and programs like self-help centers were no longer provided by the courts system). With the un-utilized space in the new courthouse—and with the realization that no funding from the court or the state would be needed to bring the idea of a self-help program to fruition—Ms Allen and Ms Pugh reasoned that this would be an opportune time to restore the self-help program to Broward County. And with Chief Judge Jack Tuter’s blessing, they began to flesh out their vision. Ms Allen—whom Ms Pugh refers to as “the captain of this ship”—says that while the idea for this program evolved over a period of years, the last three years required most of the “hard work.” But finding service providers who would be willing to get involved was not difficult: when invited to participate in this venture, “No agency said ‘no thank you’; they all said, ‘How can we do this? Let's see how we can make this work,’” Ms Allen underscores. “It’s been a collaborative effort since the beginning,” Ms Pugh adds. To sustain their continued and constructive collaboration, Ms Allen and all the agency representatives have once-a-month meetings to identify and address any concerns or issues they may have. The agency representatives also reaffirm their responsibility to identify the needs of all the people who seek them out, providing referrals to one another to ensure that each client receives the assistance he or she is seeking. Moreover, if none of the five agencies provides a service that a client needs, they are responsible for referring that person to another community resource—and for helping them access that resource. “The point is that anyone can hand a person a pamphlet,” Ms Allen stresses; “It’s the one-on-one face-time that is critical”—and that’s what Self-Help @ the Seventeenth guarantees. Judges, court staff, and clerk of court staff across the state refer people to community-based services all the time. That is nothing new, for “We know that the court is not the end-all answer to all a person’s needs,” Ms Allen points out. But what’s different about Self-Help @ the Seventeenth is that “All these services are under the same roof—a one-stop shopping kind of experience. This makes it so much easier for people,” she adds. At the same time, Self-Help @ the Seventeenth is good for the court; as Ms Allen explains, “Someone might initially feel their only avenue for relief is a lawsuit. But these resources might show them that they have other, better options,” thereby conserving the time and resources of the court (as well as of the parties themselves). On Monday, May 21, 2018, Judge T. Patterson Maney spent his last day as an active county court judge for Okaloosa County, Florida, saying goodbye to friends and colleagues and doing what he always does—clearing his docket. He was determined to leave as clean a slate as possible for his successor. However, the people of Ft. Walton Beach and Okaloosa County had some additional plans for this well-loved icon of this community. At 4:00 p.m., the large courtroom on the third floor of the Okaloosa County Courthouse in Ft. Walton Beach was overflowing with family, friends, and colleagues of Judge Maney for a special ceremony. A joint resolution was read that was entered by the County Commission of Okaloosa County and the City Counsel of Ft. Walton Beach, naming the roadway surrounding the courthouse as Judge Maney Way. Judge Maney (retired Army reserve Brig. Gen. Maney) was visibly moved by the outpouring of love from a community he has served for over 29 years as a county court judge. Presentations were made to Judge Maney from various entities of the court system, including an acknowledgment of his ground-breaking work with the veterans court. Judge Maney, while a judge, was called to active duty and sent to service in Afghanistan. On August 21, 2005, the SUV he and four others were traveling in was blown up, with Judge Maney sustaining serious, life-threatening injuries. He spent the next two years at Walter Reed U.S. Army Medical Center battling for his life. But recover he did and came back to the bench in Okaloosa County. This experience, however, gave him a new perspective and understanding of the plight of our veterans. This experience made Judge Maney the ideal person to handle the needs of veterans who find themselves involved in the judicial system. 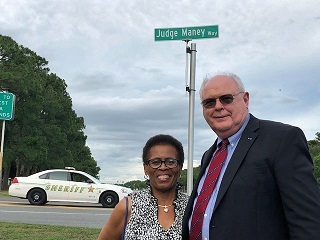 After hearing some of Judge Maney’s life story and after many presentations from various community leaders, all of those present in the courtroom were invited to go outside for the unveiling of the sign that read “Judge Maney Way”! What a deserving tribute to a man who has spent his life serving others. Judge Maney, the judiciary will truly miss your active service on the bench. But we know that you will continue to give, for that is your nature. Congratulations to judges and staff of Florida’s courts and members of the OSCA’s Office of Court Improvement team recognized by the Prudential Productivity Awards for work on the Adult Post-Adjudicatory Drug Court Expansion Program. The Expansion Program helps the state save millions with evidence-based diversion for screened participants to get community-based treatment services. It puts eligible individuals on a path to sobriety and a better life while diverting appropriate participants from prison. Outcomes include improved stability and success for participants and community gains with reduced crime than would otherwise occur in support of ongoing addiction and incarceration. The Expansion Program is operating in nine counties around the state. The Expansion Program team documented savings of $3.8 million over three years. Jennifer Grandal, Aaron Gerson, Joshua Kuch, and Chris Korn are members of the team who work on the Expansion Program within the Office of the State Courts Administrator. The Office of Court Improvement along with judges and staff in courts around the state continue to serve the judicial branch and the people of Florida with distinction. Since 1989, the Prudential Productivity Awards program has recognized state employees for innovation and productivity gains that improve the delivery of state services and save money for Florida taxpayers and businesses. In the 28 years it’s been held, more than 16,000 nominations have been received, and awards have been given to state employees for saving or maximizing state dollars totaling more than $9.2 billion. Read more about the program on our website. This year, the forums are scheduled Thursday and Friday, May 10 and 11th, in ten cities throughout the state. The Thursday forums will take place in Jacksonville, Miami, Pensacola, Tampa, and West Palm Beach; the Friday forums will be held in Ft. Lauderdale, Ft. Myers, Gainesville, Orlando, and Tallahassee. The forums will begin at 1:00 P.M.
Law Day has been marked on May 1 every year since 1958, when President Dwight Eisenhower declared the first observance of Law Day honoring the nation’s heritage of liberty, justice, and equality under the law. State Courts Administrator PK Jameson opens a new video feature on Florida courts work by highlighting Law Day and other initiatives underway now. Law Day and Law Week are also designated in Florida statutes. Law week is marked during the week containing May 1. This year, the American Bar Association has selected the Separation of Powers as the theme for Law Week. The system of checks on balances on power among the government’s three branches is a defining element of the American Republic. It was recognized by those drafting the Constitution as a vital part of their work, commented on in the Federalist Papers as the nation’s foundational legal document was being considered. “In order to lay a due foundation for that separate and distinct exercise of the different powers of government, which to a certain extent, is admitted on all hands to be essential to the preservation of liberty, it is evident that each department should have a will of its own; and consequently should be so constituted, that the members of each should have as little agency as possible in the appointment of the members of the others,” James Madison wrote in Federalist No. 51, first published in 1788. Separation of powers among branches was essential at the time of the country’s founding and it remains of great importance to protect it today. You can see more about this year’s theme at the ABA’s website. “Welcome to the best job in the world,” Chief Justice Labarga has been known to exclaim as he greets the judges who are about to take part in the three-day New Appellate Judges Program. What makes this job “the best,” he explains, is that appellate judges, working together in panels, have the opportunity for thoughtful review of the decisions of the lower tribunals; they “have time to think, time to contemplate” their decisions. Because this work situation is unique to the appellate courts, all new appointees, whether they come directly from the practice of law or from the trial court bench, benefit from assistance with transitioning to judicial service on the appellate bench. And that is what the New Appellate Judges Program seeks to provide. Offered annually, this dynamic judicial education program was established in 1991, and attendance is required by all new appellate judges. Indeed, the curriculum for this education program, consisting of a balance of lecture-style sessions and participatory learning experiences, gives attendees many opportunities to absorb, analyze, discuss, and put to the test practices designed to help them do their jobs better. Approximately half the program consists of information-imparting sessions on topics like ethics, certiorari and writs, motions and fees, supreme court jurisdiction, statutory interpretation, and post-conviction issues. The other sessions, which tend to be interactive in nature, give the new appellate judges practical opportunities to ponder, and to engage in energetic colloquies about, matters of pertinence to those who sit on the appellate bench—such as jurisdictional considerations, oral argument do’s and don’ts, working collegially (they reflect on crossing from the “solitary work of a trial court judge or lawyer” to being part of, and learning to work and to write as part of, a panel of judges), and strategies for becoming a better writer (Judge Gerber offers advice on “going from a Picasso to a Mona Lisa in your opinions”). The 2018 New Appellate Judges Program unfolded during the first week of April, at the Florida Supreme Court. When the program takes place in Tallahassee, it offers a special perk: participants get a chance to meet and interact with all the supreme court justices. This year, their first opportunity came on the first day of the program: built into the schedule was “Lunch with the Florida Supreme Court.” During this informal lunch hour, after introductions were made all around, Judge Gerber invited the justices to share some advice about being an appellate judge—and they responded candidly and helpfully, with words both of a professional and a personal nature. Clearly, the opportunities for learning transpire on a great many levels at the New Appellate Judges Program. As chairs of the Steering Committee on Families and Children in the Court and the Task Force on Substance Abuse and Mental Health Issues in the Courts, we are pleased to report on a productive joint meeting that took place involving these two Supreme Court governance groups. Members of the Steering Committee and Task Force convened in Tampa on Feb. 22 to collaborate on important overarching issues. The Steering Committee’s goal has historically been to establish a fully integrated, comprehensive approach to handling all cases involving children and families, while the Task Force has been charged to address the needs and challenges of individuals with serious mental illnesses and substance use disorders who become involved in the justice system. Both of these groups address incredibly complex, deeply-rooted societal problems that require community-wide responses to have a chance at being solved. Addressing these problems from silos is ineffective. As chairs of these two groups, we are very grateful for the opportunity to work with such committed judges, magistrates, and court leaders who have been spearheading systems change initiatives at community and statewide levels. But the courts alone cannot solve these vexing issues, which is why we are also fortunate that the Steering Committee and Task Force is comprised of stakeholders spanning a vast array of disciplines, including representatives from school districts, behavioral and mental health organizations, universities, the Agency for Health Care Administration, the Department of Children and Families, the Department of Corrections, the Department of Juvenile Justice, the Department of Health, the Guardian ad Litem Program, state attorney offices, public defender offices, the private bar, and other community organizations. It’s no surprise that crossover issues have emerged that these two groups have been concurrently tackling. These overlapping issues, along with the recognition that we must break down our silos to effectively solve these problems, served as the impetus for this joint meeting. Between the two groups, over 60 members attended the meeting; Justice Barbara Pariente and Justice Peggy Quince, the Supreme Court liaisons for the Steering Committee and Task Force respectively, attended as well. As a result of attending, members from both groups were able to discuss common initiatives and determine the necessary follow-up actions. The first issue that members addressed was problem-solving court standards and certification. This issue of consistency and institutionalization of practice – that is maintained across judicial rotations and staff turnover — is of paramount importance in the handling of both family and criminal court cases. In a previous term, the Task Force developed Adult Drug Court Best Practice Standards, which were subsequently approved by the Supreme Court. A subcommittee of the Task Force is currently working on a proposed certification framework for the approved standards that will ensure that drug courts are operating with fidelity to the standards. Task Force members shared with Steering Committee members the process they went through in creating the standards as well as the ongoing work to develop a certification framework. This topic is directly related to a current initiative of the Steering Committee in the area of pursuing best practice standards for Early Childhood Courts, Florida’s newest problem-solving court docket. The Steering Committee has mirrored the efforts of the Task Force by developing Early Childhood Court best practice standards, with the goal of the standards being approved by the Supreme Court. During yesterday’s meeting, it was extremely helpful for Steering Committee members to hear from Task Force members on the lessons learned in regard to the development and implementation of their standards. The Steering Committee members who are currently embarking down this parallel path for Early Childhood Court standards left the meeting armed with the knowledge of pitfalls to avoid and promising practices to employ. As a result of the meeting, the Task Force fidelity workgroup will review the Steering Committee’s Early Childhood Court Standards and provide feedback. The Baker Act is another overarching issue that is currently being addressed by both groups and was discussed at the meeting. The Task Force is charged with monitoring the implementation of recent legislative changes relating to the Baker Act and providing training and technical assistance on how the changes should apply to the judicial processing of Baker Act cases. Task Force members have examined the Baker Act process from many angles, including assessment, evaluation, and receipt of services. The Steering Committee has focused on juvenile Baker Acts within the context of its monitoring of school-justice partnerships that ensure children involved in family court cases stay in school and are less likely to be arrested, suspended, or expelled. The recent reduction in school-related arrests, expulsions, and arrests, coupled with an uptick in juvenile Baker Acts prompted the Steering Committee to look at this relationship more closely. Steering Committee and Task Force members discussed current Baker Act legislation, the recent Task Force on Involuntary Minors report, and commonalities between each group’s Baker Act initiatives. For several years, the Steering Committee has been promoting trauma-responsive practices for family courts to adopt and use. A product of these effort is the Steering Committee’s Trauma and Child Development Family Court Tool Kit. In addition, OSCA has developed a trauma curriculum that judicial circuits can use to conduct local trauma-responsive court trainings. The discussion at yesterday’s meeting prompted the expansion of the tool kit and curriculum to be applied to all case types since trauma is certainly a primary factor in drug courts, mental health courts, veterans courts, and criminal courts as a whole. As a result of the meeting, pertinent information and practices will be imported from the trauma tool kit and be applied to other case types. Lastly, both of these groups shared ideas on judicial branch strategies to address the opioid crisis. As with the other issues discussed at this meeting, the sentiment was expressed that we must not operate out of our individual silos to address this epidemic. And with state and federal funds and technical assistance coming in to the state from so many directions, it is imperative that we also ensure that new silos are not created to accompany the influx of new resources. Members also expressed how vital it is that we do not lose sight of addiction treatment for other drugs since Florida’s addiction problem is not limited to any particular substance. After a legislative update, an overview of state and federal funding resources, and case-type-specific responses, Steering Committee and Task Force members brainstormed court-related approaches to the crisis in the following four domains: judicial education, judicial leadership, judicial decision making, and the role of chief judges and trial court administrators. Both groups believe strongly that a comprehensive and coordinated court response to the opioid crisis is a prudent use of government funds and is in the best interest of children, families, and judicial economy. With the 2016-2018 Steering Committee and Task Force terms coming to an end in June, this meeting offered an opportunity to reflect on all of the great work that has been going on across the state and also served as a catalyst to continue pushing this important work forward in new and challenging directions. We would both like to sincerely thank all of the members for their engagement, and we look forward to more collaborations in the future.